Most of yesterday was spent biking one of the trails near our home followed by copious amounts of reading, cleaning and baking. It was pretty routine, nothing out of the ordinary but then this happened! As much as I wanted to, I couldn't attend the IACP:International Association of Culinary Professionals awards in Washington D.C. this year but when I got the news via Twitterverse that I had won the award for Best Photo Based Culinary Blog of 2015, I was shocked and ecstatic. It's an honor and a humbling experience to be included among some of the critically acclaimed people in the food industry and to think that something like this could even happen one day, never crossed my mind. We celebrated with a little feast of homemade pizza topped with barbecue chicken and lots of melted cheese. Your continued support means the world to me, thank you! You can also check out the rest of the winners from this year's awards here at the Washington Post. Sometime last year, I found out my body reacts badly to high-acid coffee brews. I pretty much reduced drinking coffee to avoid the effects of acid-reflux, the weird "lump-in-your throat" experience but since I'm more of chai drinker, reducing my coffee intake was not too hard. I still find the aroma of freshly brewed coffee very enticing. 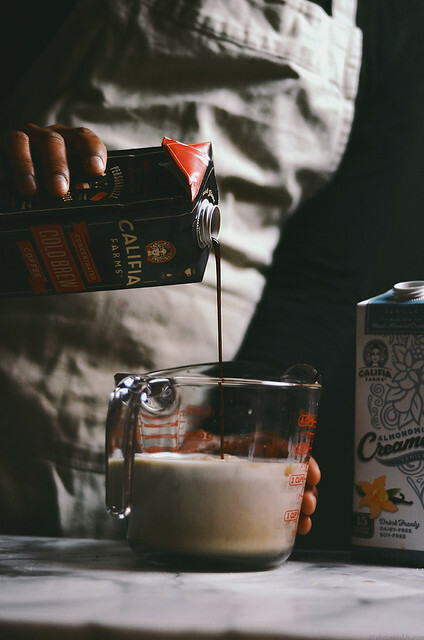 When Califia asked me to try out their new low-acid cold brew coffee, I was more than happy to test it. I've been using it to make a few cups of coffee during the week for us, it tastes good and I haven't had any acid-reflux issues. 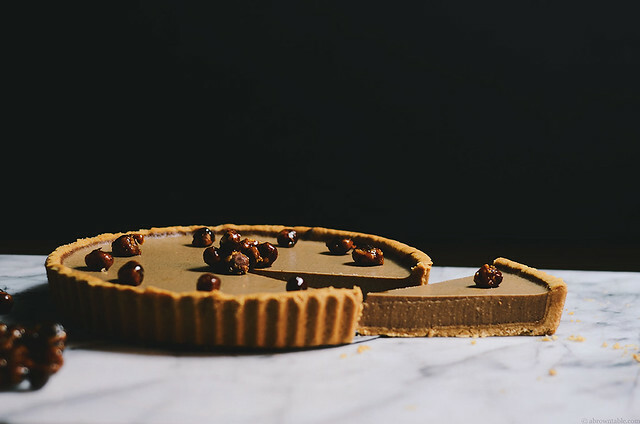 Because their coffee brew has a nice smooth flavor and taste, I decided to make this tart, that has coffee and hazelnuts. I love hazelnuts and when I do drink coffee, I love a little bit of a hazelnut creamer or even double-dose with a hazelnut coffee brew. I like to use tart pans with a removable bottom. They're easy to work with and you don't have to stress out too much when lifting the crust. Use the clingfilm method I've discussed to line the tart pan with the pastry. It will give you a nice smooth and clean surface. My crust is made from oat flour and almond meal. I wanted it to be very neutral tasting against the stronger flavors of the coffee and hazelnuts. You will notice, I don't add any sugar to the filling because the creamer I used sweetened the filling perfectly. But I still recommend tasting the liquid before you heat it up to make sure you the sweetness to your desired level. I use gelatin the filling but you can surely use agar-agar if you want to make it vegan. You will also note, I used Califia's almond creamer but they have one flavored with hazelnut too, if you use that you will get a more intense hazelnut flavor. Either works great. 1. 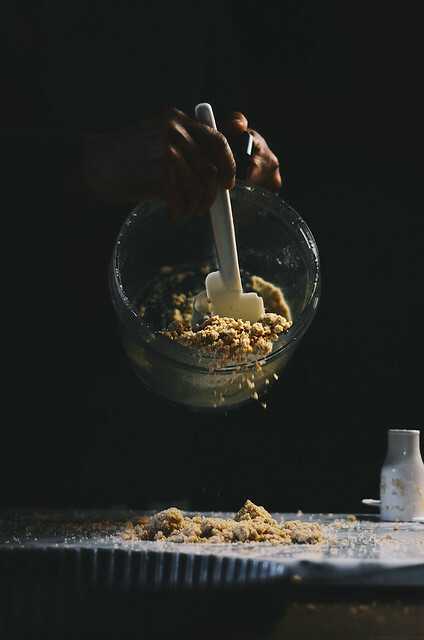 Place all the ingredients from the oat flour to the sugar together in the bowl of a food processor attached with the dough blade and pulse a few times until evenly combined. Pour in the warmed coconut oil and pulse until the mixture comes together and forms crumbs. Transfer the dough to a smooth clean surface such as a marble pastry board and bring it together with your hands to form a ball. 2. Take a fluted 9 inch tart pan with a removable bottom. Cover the base with a circle of parchment paper cut to size. Spray lightly with a neutral baking spray. Transfer the pastry dough to the tart pan and spread it out a little just enough to flatten the ball. Then cover the surface of the pan with a large sheet of cling wrap. 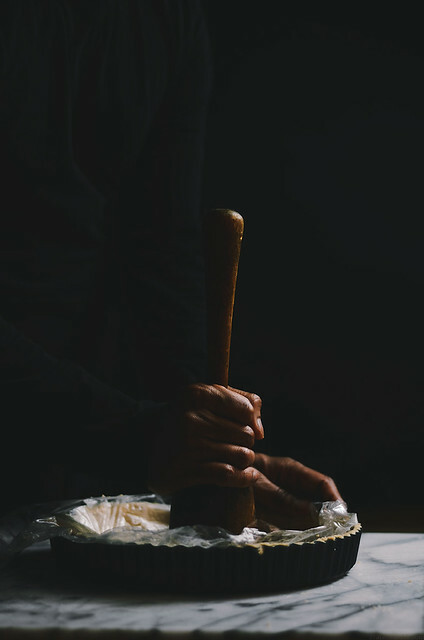 Using a large flat surface such as the bottom of a small bowl, bottle or a meat tenderizer or pounder start to spread the pastry out in the pan to form a clean, smooth and even crust. 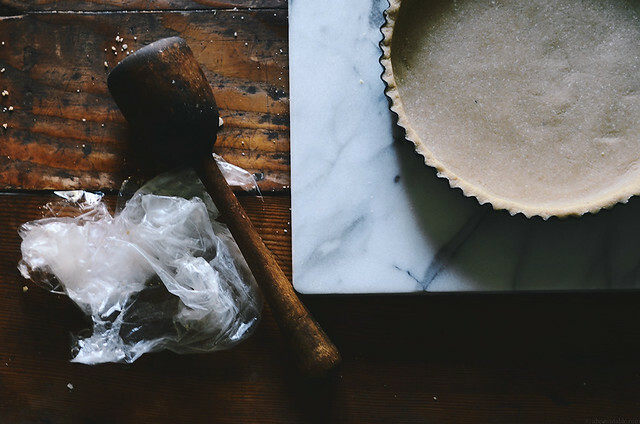 Press the pastry against the sides of the tart pan until the entire tart shell is formed. 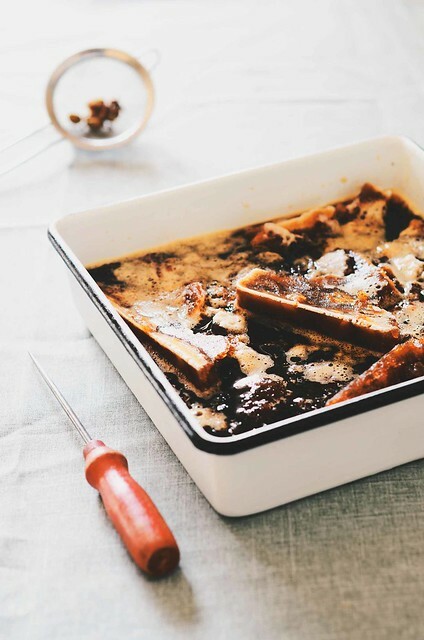 Cover the tart pan with cling film and freeze for at least 30 minutes before use. 3. Place a wire rack in the center of the oven and preheat to 325F. Remove and unwrap the chilled tart shell. Place it on a baking sheet and cover the surface with a parchment paper cut to size (just large enough to cover the top surface). 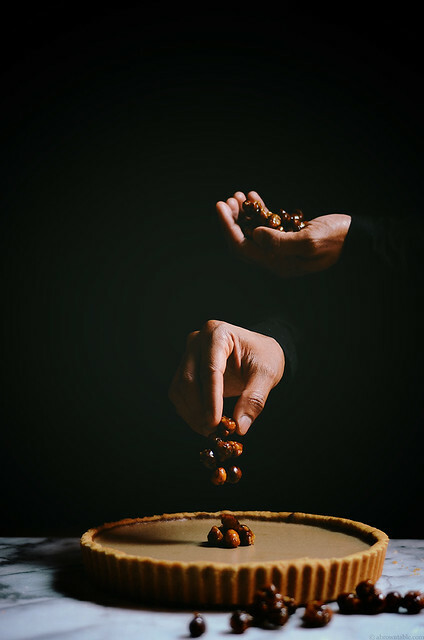 Pour baking beads or dried beans and blind bake the shell for 35-40 minutes or until the crust gets golden brown rotating the pan half-way through baking. Once the shell is baked, remove from oven and place the baking sheet on a wire rack to cool completely. Refrigerate the tart shell in the tart pan until ready to assemble. I recommend wrapping the entire tart pan with the shell in clingfilm if you don't plan to use it the day you made it. 1. Place the hazelnuts on baking sheet lined with parchment paper or a silicone baking mat and bake in an oven at 300F for 5-8 minutes. The nuts should be fragrant and turn a light golden brown but should not be burned. Watch them very carefully to avoid burning. As soon as they are lightly browned, transfer the nuts to a clean kitchen towel and wrap them up. Rub the nuts while they are in the towel to remove their skins. if you're using hazelnuts without the skins then you can skip the towel step. Remove the nuts and transfer the warm nuts to a food processor fitted with a regular blade. Pulse for about 8-12 minutes (depends on the strength of your food processor) until the nuts are converted to a smooth butter. 2. In a separate bowl, pour in the measured almond milk, coffee and creamer. Whisk to combine. Then stir in the hazelnut butter and mix well with the whisk. (Note: I haven't added any sugar as the creamer is sweet enough, however you can add sugar/sweetener at this point if desired, taste the liquid to determine this). Transfer the liquid to a thick bottomed saucepan and heat on a medium high flame until the mixture starts to boil. Boil for 1 minute. 3. While the almond milk liquid is being prepared, add the gelatin to a large bowl containing water/almond milk and allow to bloom. Once the gelatin has bloomed pour the boiling hot liquid from step 2 through a strainer or sieve over the gelatin and allow it to sit for 1 1/2 minutes before stirring with a whisk. 4. Unwrap the refrigerated tart shell and pour the filling into it just enough to reach the upper edges of the shell (don't overfill). Remove any air bubbles or foam by skimming the surface with a spoon. Allow to sit at room temperature for at least 45 minutes-1 hour before transferring to the refrigerator. Allow to set overnight until firm. Release the tart from the pan by pushing the bottom. 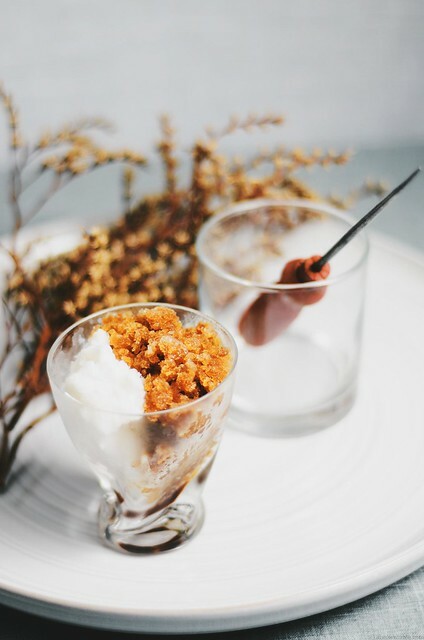 Decorate with candied hazelnuts and serve chilled. Cut slices with a clean sharp serrated knife. Disclaimer: This post is sponsored by Califia and all opinions stated here are purely my own. Labor day might officially mark the end of summer but I really don't want to give two hoots about the start of fall yet. It always seems too soon, especially when you love one season more than the others. It also really doesn't help that some of the television channels are running Christmas movies right now (what happened to Halloween and Thanksgiving?). Thankfully, the warm weather and I are on the same wavelength with neither of us wanting summer to leave, I know summer will put up a decent fight. So until autumn boots summer away, I'm going to happily chill out with these coffee granitas and think about all things . I love Thai and Vietnamese iced coffees, each of them unique in their own special ways, one flavored with spices such as green cardamom while the other, sweetened with condensed milk. You can't go wrong with either of them, at least that's what I think. 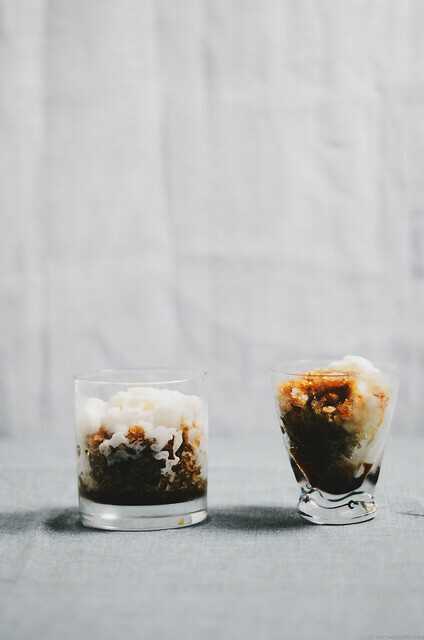 Since, it's hard for me to pick a favorite, I decided that the best thing to do, would be to create a granita, that represented the personalities of both of drinks. Double the inspiration and double the dose of flavor as the name suggests! Since this is a double granita, let's start with the first one, the coffee! I recommend using a chicory type of coffee but if you have a personal favorite, feel free to try that out in this recipe. The coffee granita is mixed with a sugar syrup infused with freshly crushed green cardamom pods that makes this simply amazing! 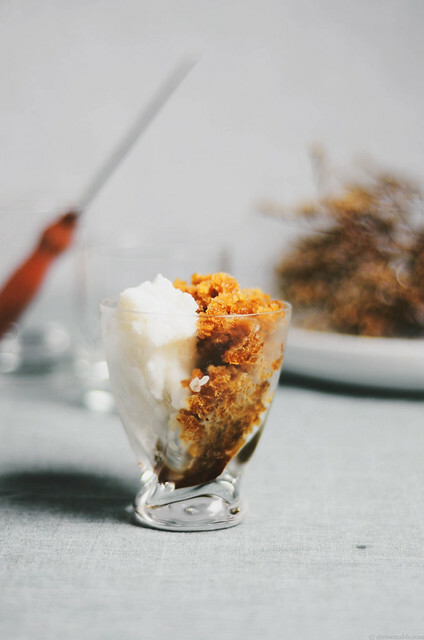 The second granita is a little different, instead of using condensed milk, I decided to use sweetened coconut milk that is infused with vanilla, I find that it freezes well and tastes great. Condensed milk would give a more ice cream like texture that I didn't want for this dessert. This coffee granita is going to be my buddy this weekend while I enjoy the long holiday. Have a great weekend! 1. Using a mortar and pestle, crush the green cardamom pods to release the seeds and crush the seeds. Add the crushed cardamom (the green shell with the crushed seeds) to a medium sized saucepan with the water and 1 cup of the sugar. Bring the contents to a boil on a medium-high flame. Once it begins to boil, remove and stir in the coffee. Remove from stove and keep aside. Allow to cool to room temperature. 2. Add the remaining 1 cup of sugar to the coconut milk in a medium-sized saucepan. Using a sharp knife slit the vanilla bean across its length. Scrape the seeds and add the seeds and the bean to the coconut milk. Heat the mixture over a medium-low flame for about 10 minutes until the sugar is completely dissolved and the milk just begins to boil. Remove from stove and allow to cool temperature. (If you're using vanilla extract, then add the extract after the liquid is removed from the stove). 3. Once the coffee mixture is completely cooled, stir and pass it through a tea strainer to get rid of the cardamom. Pour the liquid into a flat pan that is freezer-proof (I used a cake pan). Cover with cling film and place in the freezer. 4. 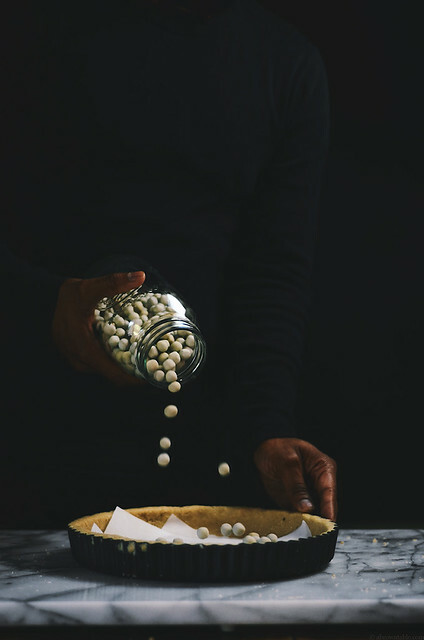 If you used a vanilla bean in the coconut milk, remove the bean and discard. Pour the rest of the coconut is freezer-proof (I used a cake pan). Cover with cling film and place in the freezer. 5. After 1 1/2- 2 hours remove both pans from the freezer. The mixture in each pan should resemble a frozen slush. Crush any large frozen chunks that might have formed and stir the contents. Cover each pan with cling film and place back in the freezer. After 30 minutes crush any large chunks and stir the contents, cover and place back in the freezer. After 1 1/2 to 2 hours, the mixture in each pan will be frozen, remove the cling film and scrape the surface with a fork to create flaky crystals. At this point the granita is ready to serve. 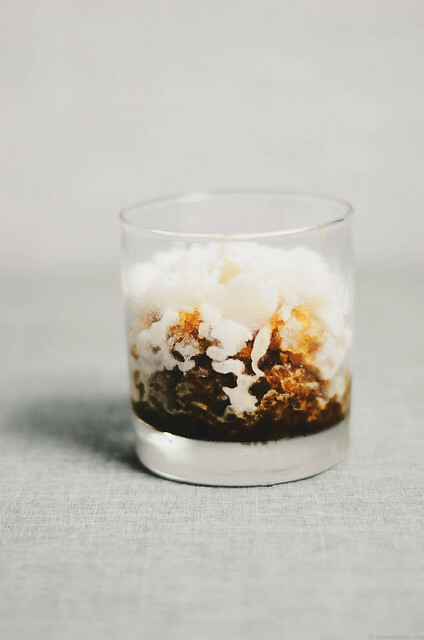 Serve in chilled glasses filled generously with half of the coffee granita and half of the coconut milk granita.